The peppers are a variety of the South American sweet pepper, which make their way into dishes like Venezuelan Hallaca (a savory tamale-style dish) and Puerto Rican sofrito (a sauce with onions, peppers, garlic and tomatoes). 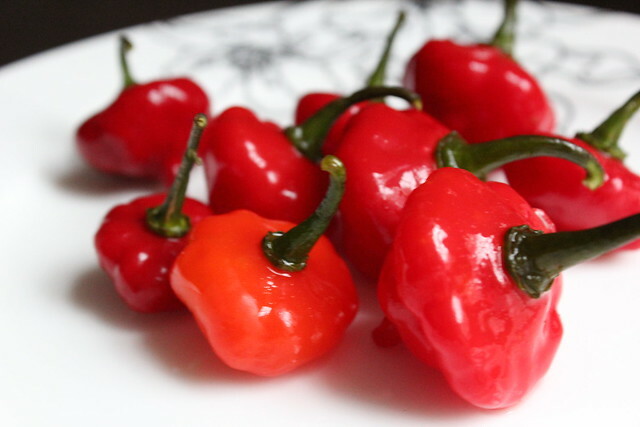 With a similar look to the habanero, they range in color from pale green to bright red and orange, and are actually surprisingly mild. I love the smoky and sweet flavor that I’ve used in everything from roasted tomato salsa to a classic arroz con pollo. Although I often use it to make Latin dishes, I’ve started to learned just how versatile this little red pepper is. Lately I’ve been playing around with using cachucha peppers in Thai dishes. I love the slight sweetness that it adds to some of the spicy dishes and the texture that it adds to creamier ones. The dish I fell in love with, though, is a combination of both. 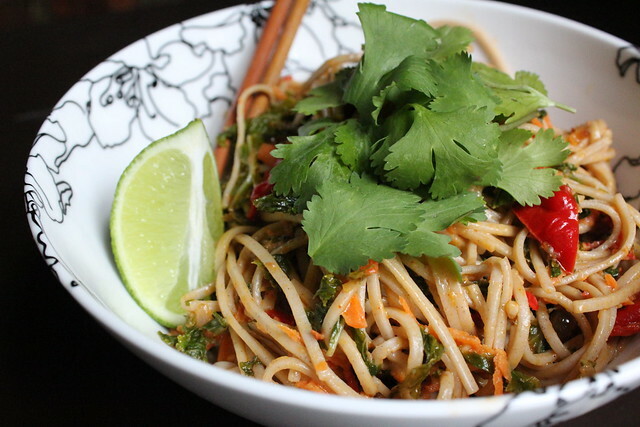 Thai-style soba noodles with cachucha peppers, baby kale and carrots. The creaminess of the peanut butter and coconut milk gain a great added spice from the Thai red curry paste and added depth from the Thai fish sauce. Meanwhile, the kale and cachuchas brighten up the dish. Although I’ve found the easiest way to acquire cachucha peppers is from my own garden (or my mom’s), buying the peppersor actual seeds online isn’t that difficult. You can also occasionally find them in Latin grocery stores. The only difficult part of this recipe, really, is that deseeding the peppers takes some time. I usually try to go through to deseed and mince them ahead of time. In fact, I find that having a small jar of minced cachucha peppers that I can throw into recipes is my favorite part of cooking these days. This mildly spicy noodle dish combines the flavors of Thai with Cuban cachucha peppers for a perfect mix. You'll spend most of your time deseeding the peppers, and it's fine to do that ahead of time. If you can't find galangal in your local grocery, replace it with ginger instead. Heat a large pan and place the coconut oil. Once it has sufficiently melted, add the shallots and sauté for about 2-3 minutes or until they are golden. Add the cachucha peppers and sauté for another 2 minutes, then add both the garlic and galangal. Continue to sauté, stirring well. Meanwhile, bring a pot of water to a boil and add the Soba noodles. Continue cooking, stirring as needed, for about 4-5 minutes until they are al dente. Once ready, drain and set aside. In the sauce pan, add in the peanut butter, red curry paste, coconut milk, fish sauce and juice of lime to the pepper mixture. Stir until the mixture is a golden, creamy color. Add in the baby kale, mix it thoroughly with the sauce, and continue to sauté until the kale is done (about 5 minutes). 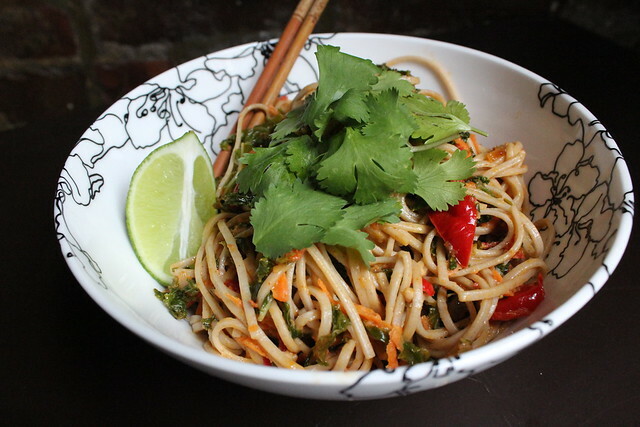 In a medium bowl, combine the soba noodles, kale in sauce and carrots. Toss together, then serve warm with a garnish of cilantro and wedge of lime. Have you ever cooked with Cuban cachucha peppers? This entry was posted in Cuban, Gluten-Free, International Flavors, Vegan, Whole Grains and tagged cachucha peppers, cuban, soba noodles, Thai by Irina Gonzalez. Bookmark the permalink.